Should you shoot for free? Would you expect to call a plumber to fix your kitchen sink for free? I’ve been into photography for quite a few years now as I’m sure many of you are. It started out as a hobby and a way to capture images of family and vacations. Then as it happens I got the equipment bug and started buying more expensive cameras and lenses and took the craft of photography more seriously. I started taking photography workshops, reading, taking online courses and learning from experienced photographers. Over the course of time, I’ve become what I consider a semi-professional. I post images across the web, people pay me for photo-shoots and I sell stock images. Recently, I became interested in videography since my DSLR does video. I wanted to learn how to make great videos, so I learned from reading books, online and talking to people about the craft. Eventually, I wanted to shoot a few videos for a website I have and found someone I know that was an expert in the skill I needed, so I asked and he agreed to spend a couple of hours with me shooting the video. Well it didn’t turn out that well, but I learned a lot from the experience. In this instance, I felt I owed this person for his time since I was benefitting and I guess I still owe him lunch. A couple of months later, another opportunity popped up to shoot more videos. I wanted to learn and improve my skills, so I agreed to shoot the videos for free. This turned into a 5 month gig shooting a few videos a week for FREE. I didn’t mind it for a while, I was getting some good exposure and learning, so I felt it was an investment. Soon I started to resent shooting the videos without any compensation. This was absolutely my fault for not stopping or asking for money. This person is someone I consider a friend, so I really didn’t want much, anything would have been okay, say $50 a video, which is a steal. Again, I take responsibility. Lesson learned. During this time, I was asked by another videographer to help him shoot a day long video of a local fitness celebrity. I thought it would be a good experience, something different, so I agreed. He also asked me to bring along my video lights. It was a really good experience and I learned a lot, but again, no payment, again, my fault for assuming people will do that right thing and pay me out of the goodness of their heart. Just a token, minimum wage would have been fine. Again, my fault. Sometimes it takes me a while to learn from my mistakes. Recently, I was asked to be a second shooter that involved travel for a friend. I thought it would be fun to get away to a warmer climate so I agreed if he paid my expenses. Again, I perpetuated the issue of non-payment for my time. I ended up staying in a bunk bed in a closet, but the weather was nice and I continued to learn. Well we did finally come to an agreement on a per video basis, it isn’t much, but I’m still learning and he is a friend. That’s my story and my lesson. Will I shoot for free moving forward? No! Absolutely not, even if it’s for just a minimum amount of money. Should you ever shoot for free? Sure, I think there are cases where it’s justified, for example, if you’re building a portfolio or shooting for family, but set limits and it’s better to charge something rather than nothing. When you charge nothing the person you’re shooting for doesn’t value your work, plus it hurts the photography and videography industry. If someone asks you to shoot photography or video, they obviously think you’re good enough to do the work, so they should expect to pay something in return. Honor yourself by asking for payment; clearly you’re worth it! I’m currently on vacation on the island of Maui. Each time I come to the Islands I hope to get a chance to shoot the Milky Way from atop Haleakala, weather and moon permitting. Well once again, it hasn’t worked out because I’m here during a full moon phase. I decided to make the best of it and head down to a relatively dark area near the water hoping I could at least get a glimpse of the Milky Way. I set the ISO to 5000 on the D700 and tried a few long exposure shots to see if I could locate it. No luck, the moon was just too bright. I had my Fuji X100 along, so I decided to try some long exposure shots. I usually have the ISO set to auto on the Fuji X100 and aperture priority mode. So I needed to change the settings to force it to ISO200 and also set the shutter dial to “T” so I could adjust the length of exposure. The other issue came when I tried to focus. Because it was relatively dark, there wasn’t enough contrast to focus on anything. The Moon was at my back so I turned and focused on the Moon then set the switch on the side to manual focus so it would basically stay at infinity. Since I don’t have a remote shutter release yet, I set the camera to a 2 second timer release and set it on the tripod and fired away. This is the first shot. I was impressed. The noise is manageable and rather quite impressive for a small camera. You can see it almost looks like daylight. The Moon was very bright. Here is the second shot, I had the aperture wide open. There was a little path light just behind the camera on the right that was helping to illuminate the kayaks. And the final shot taken with the Fuji X100 sitting on a fence rail. I set the ISO back to AUTO and this was taken at ISO 1600, 20 second exposure. It had a lot of noise. I used Topaz DeNoise to help reduce the effect. I would recommend forcing the camera to the lowest ISO possible, which is always a good idea for long exposure images, especially if you are using a camera with a smaller sensor. This is something I can get away with on my Nikon with its full frame sensor. I’ve been very impressed with the capabilities, features and ease of use of the Fuji X100 and will definitely use it when I don’t want to lug around the larger camera and all the lenses. I’ll have more examples in the coming weeks. Stay tuned. A few years ago I took a photography workshop by LeRoy DeJolie. LeRoy is a native Navajo indian and creates wonderful images, mostly with large format cameras. Since then a friend and I have hired LeRoy on a private basis to take us to places most people can’t get to, or at least not easily. The highlight of the workshop for me was the visit to lower Antelope Canyon. It’s truly an amazing place, pictures and words don’t begin to describe it. The Canyons are on Navajo land so you have to pay to get access. I believe the cost back then was around $25. We weren’t part of a tour and I think we were limited to 3 hours in the canyon. I understand now they ask if you have a mirrorless camera and if not, you have to take one of the tours. I’m not quite sure what the logic is, but I assume it has something to do with having a “professional” camera. There can be lots of people in the canyon, so be prepared to wait to get your shot. You definitely need a tripod and I would recommend something to cover your camera, because it can get quite dusty down there. I wouldn’t recommend changing lenses while in the Canyon. Lower Antelope Canyon is about a quarter of a mile long. The entrance is a sloping stroll and then once you’re in the canyon is fairly easy to get around, though there are some very tight squeezes in some sections. The exit at the far end is a very steep ladder, or you can turn around and go back to the entrance. There are a plethora of shots to be had in the Canyon. I can’t imagine any two shots being the same. You’ll want to visit the Canyon sometime in late morning to early afternoon so the sun illuminates the upper part of the Canyon depending on the time of year. I probably took about a hundred photos and I kept about a third of those. I had so many it was difficult to pick my favorite, but after reviewing the images a few years later, I think this is my favorite. I really like the contrast and the wonderful colors. If you are looking for a great workshop, I highly recommend photography workshops led by LeRoy. You can find his workshops on the Arizona Highways site, or dejolie.com. This is a shot I took during The Wall concert up here in Seattle. My girlfriend, a big Pink Floyd fan and I went to the concert and were lucky enough to get seated on the floor about 20 rows from the stage. I took this with my iPhone 4S not expecting it to turn out, but with a steady hand and the HDR feature turned on, I think it came out fairly well. Though I’m happy with the snap, it was very noisy as can be expected with such a small sensor and shooting in the dark. I did run this through Topaz DeNoise in Photoshop before I posted it here to reduce some of the noise, nothing else was done to the photo. Not bad for a photo to post to the web. Remember, you don’t always need the top of the line photography equipment to get a great shot. Great concert, by the way. In my last post I showed how to use the Adaptive Wide Angle filter in Photoshop CS6. For the example I used St. Stephen’s cathedral. I decided to post the final image today which I converted to black and white. I made that choice because I took this after the blue hour and the sky is completely black. I used one of my favorite plug-ins, Nik Silver Efex Pro 2.0. I really like the ease of picking from one of the B&W presets in Silver Efex and then modifying the options and sliders to my liking. For this image I chose the Fine Art Process preset and the only thing I modified was that I added a Film Type to accentuate the contrast; Kodak ISO 32 Panatomic X. I like how this turned out in black and white. I really like some of the new features in Photoshop CS6, it seems like when you think Adobe can’t make Photoshop any better, they do. I have found the Adaptive Wide Angle filter very useful for a lot of my images of architecture, both interiors and exteriors. Since I don’t own a tilt-shift lens, my photos of architecture end up with converging walls and tilted buildings because the lens isn’t level vertically and horizontally. In the past I used the Lens correction feature, the Transform tool and Puppet Warp, to correct the horizontal and vertical issues, but those didn’t always work out as well as I would have liked. With the new adaptive wide angle filter, it’s very easy to fix all of those issues. Check out the video where I go through how to correct an image of a church in Budapest using this great new feature. This is my first video tutorial, so I’d like some feedback for future videos. I tend to carry different cameras at different times depending on what I’m doing. I consider my iPhone 4S a camera too. I currently have 4 cameras; a Nikon D700, Nikon D200, Fuji x100 and a Panasonic LX3. The LX3 used to be the camera I carried most often, but now that I have the x100, I tend to take that camera with me, but I always have my phone. I do get lazy and in a hurry and I don’t always take a camera and sometimes I neglect to remember that my iPhone is also a camera. I have many apps on my iPhone including timelapse, HDR and photo editing among other photographic related tools. The camera doesn’t have the resolution of a DSLR, but it’s not bad and probably compares to a point and shoot from a few years ago. I work on the 19th floor of an office building and there are some amazing views. Last night the sun was setting, reflecting off the lake and strongly illuminating some buildings that I thought was interesting. I had wished I had my x100 with me, but all I had was my iPhone, I wasn’t sure the iPhone could capture exposure range, but I gave it a try. I ran the Pro HDR app and then applied one of the black and white filters. I’m very happy with the result. It’s nothing that’s going to win any awards and I’m sure it probably isn’t a print candidate, but it looks great on the web. I like the reflections, hard light and resulting contrast. I think the image turned out well especially for a camera phone. My lessons from this experience? Use the camera you have with you and shoot every day. I love the look of those really long exposure images that are captured with multiple stop ND filters, especially 10 stops or more. I’m even more passionate about the black and white photos, there’s something about them that stirs me, maybe the surreal feel. There are many options for 8 to 10 stop filters ranging from the Singh-Ray Vari-ND, the Lee Big Stopper or the filter I chose, the B&W 110 – 10 stop filter. There are also many more less expensive options available. There are 2 versions of the B&W filter, the single coated version and the multi-coated version. I opted for the multi-coated version as I understand it should help with flare and reflections. With the B&W filter there is about a $70 difference between the two. You should be able to buy the B&W multi-coated version for around $180 for a 77mm filter. I purchased a single coated version about a year ago, but somehow it got damaged in my camera bag. It wasn’t obvious at first, but the metal was slightly dented and wouldn’t screw onto the lens properly. Even though I had it in its protective case, I’m guessing someone got a little too aggressive trying to fit their luggage into the overhead bin on a flight and bent the filter. I now put my camera bag under the seat in front of me. Lesson learned. 10 stops filters are great for blurring cloud movement, making waterfalls are silky, smoothing out rough water and making moving cars and people seem like they have disappeared. The possibilities are only limited by your imagination. I’ve read about people experiencing color shifts with some of the filters. I haven’t noticed anything with the B&W, though I’m converting to black and white so I’m not too concerned about the color shifting. I also shoot in RAW so I can easily fix and shift. It also seems to be more prevalent in the cheaper filters. So now that I replaced the filter with the new multi-coated version, I was excited to give it a try. I received the filter a few days before a business trip to London so I thought I would shoot the London Eye during daylight hours and see if I could slow the shutter down enough with the 10 stop filter to blur the ferris wheel and possibly be lucky enough to also have some fast-moving clouds that would feather out during the long exposure. One afternoon I headed down to the Thames and set up my tripod across from the Eye. Once you put the filter on your lens you can’t see anything through the viewfinder, so you will want frame your image, take note of the exposure settings and once you have the lens focused, set it to manual focus, then you can attach the filter. I wanted as long as an exposure as I could get, so I set the aperture to f22 and since I was in aperture priority mode the camera showed a 2 second exposure without the filter. Now you need to add approximately 10 stops to the shutter speed, which made it 20 seconds, I decided to try a 25 second exposure. Here is the result. This image is pretty close to what I was looking for. I wish the clouds were a little more feathered, but overall I’m happy with the photo. I did all the processing in Lightroom 4. There were a couple of boats that passed through while the shutter was open, but as you can see, they just seem to disappear. Pretty cool stuff. I have lots of ideas for the filter and can’t wait to try them out. I’ll post the images. This year’s Photo book has been released and there is some amazing photography inside. I am a member of the Microsoft Photography Club. Again, this year a group of individuals volunteered their time assembling and publishing another world-class, fine art photo book. All the images were donated by people employed by Microsoft. The book contains 453 professional quality images. You can see a preview online at http://photographersatmicrosoft.com . All proceeds from sales of the book go directly to the United Way and you get a valued and timeless reminder of how you too make a difference to those in need. This book will make a wonderful addition to your collection of photography books, or could be a thoughtful gift. Each copy you purchase contributes directly to the ongoing, important work of United Way. This book is offered for purchase at $50.00. If you’re interested, my photo from the Palouse was included in the book and you can view it in the preview. Even if you don’t think you’ll buy a copy of the book, go take a look at the online preview anyway. It truly is an amazing collection of photography! Signing into the site to purchase the book can be kind of confusing, so here is a direct link. https://shop.ecompanystore.com/MSCompanyStore/_ShopHandler.aspx?_do=SignupWL . 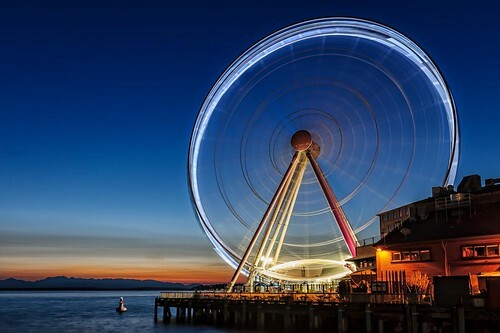 This is a recent long exposure photo I took of the new Ferris Wheel on Pier 57 on the Seattle waterfront with my D700 and the Nikon 24-70 lens. I cranked down the aperture (f16) so I could get a longer exposure. The exposure was 6 seconds. The Ferris Wheel turns rather slow and I needed as long of an exposure as I could get to capture the movement. I had to time it right because the Ferris Wheel kept stopping to load and unload passengers. I really didn’t need a lot of DOF in this photo since there was nothing close to the camera so I could have been fine with a larger aperture. I really like how this turned out with the orange sky over the Olympic mountain range and the nice blue hour sky. I processed this in Lightroom4 and took advantage of the highlights and shadows sliders especially to tone down the bright area at the base of the ferris wheel. You can click on the image and see a larger version up on my Flickr page. It’s also available for sale on my portfolio site at http://jmclarkphoto.com , then click on the “Recent” link under the portfolio link. Jim: You're welcome. Larry. Let me know if you have any questions. seoul: Very nice design and style and good subject matter, practically nothing else we need :D.
todays date: i love your blog, i have it in my rss reader and always like new things coming up from it. © 2019 JM Clark Photography Blog. All rights reserved.